Strong cast and remarkable writing mark this outstanding 1974-1978 British TV comedy series. One of the most talented quartets of comic actors of all time ran wonderfully amok in the superb 1974-1978 British TV series Rising Damp. In it, fabulous funnyman Leonard Rossiter starred as frenetic, cranky, cheap, boastful Rupert Rigsby, the landlord of a seedy Yorkshire boarding house. Frances de la Tour, Don Warrington, and Richard Beckinsale were comically adept as his regular tenants. The critically acclaimed and very popular show ran for 28 episodes during four seasons (all available on Netflix, with many episodes on YouTube). 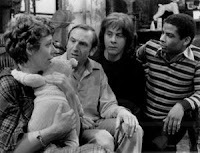 Rising Damp won the Best Situation Comedy BAFTA award, and Rossiter was nominated for two more BAFTAs. More than 93.9% of viewers rating it at imdb.com gave it thumbs-up, and 34% consider it a perfect 10. 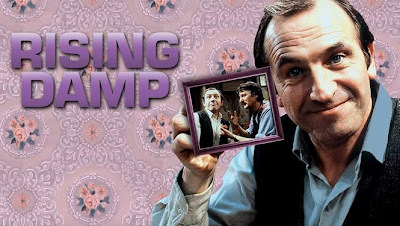 In a 2004 poll, Rising Damp was voted the best sitcom ever to air on the 15-network Independent Television (ITV) group of British channels. 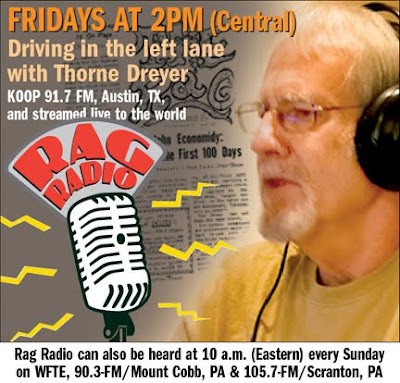 Here is a sample episode. In Rising Damp, landlord Rigsby is interfering, dour, cowardly, and insulting, and he ignorantly expresses bigoted, right-wing views. A character with so many negative qualities should be very unpleasant, but Rossiter is such a dazzling comic actor, with astonishing manic energy and perfect timing, that we are totally captivated by his over-the-top ridiculousness. Rigsby has the ill-disguised hots for single tenant Miss Jones (Frances de la Tour -- perfect as a lonely, romantic spinster). She vainly fancies upstairs neighbor Philip Smith (Don Warrington), a college student from Croydon (South of London) who convinces the gullible Rigsby that he has 10 wives and is the son of an African chief. This is the inspiration for many droll wisecracks from Rigsby. Actually, Phillip is intelligent and sophisticated, making him the ideal foil for the grubby, unsophisticated Rigsby. For the first three seasons, Phillip’s roommate was Alan, an impecunious, long-haired medical student who had poor luck with girls. Richard Beckinsale was charming in the role, but tragically he died of a heart attack at age 31. Rossiter also died too young, at 58. So far, Warrington and de la Tour are healthy and continue to do good work -- he in Manchild and New Street Law and she in Hugo, The History Boys and two of the Harry Potter films. I just watched six episodes of Rising Damp again this week and howled once more at Rigsby’s antics, while marveling at Eric Chappel’s magnificent writing. I have often said and written that one of many reasons that the best Britcoms are far superior to their American counterparts is that they have only six to eight episodes per season, and all are written by the original genius. Whereas it seems as though four of the 22 annual U.S. sitcom episodes are written by the series creator while another three are penned by the producer’s mistress and five more are scribbled by the network executive’s idiot nephew. 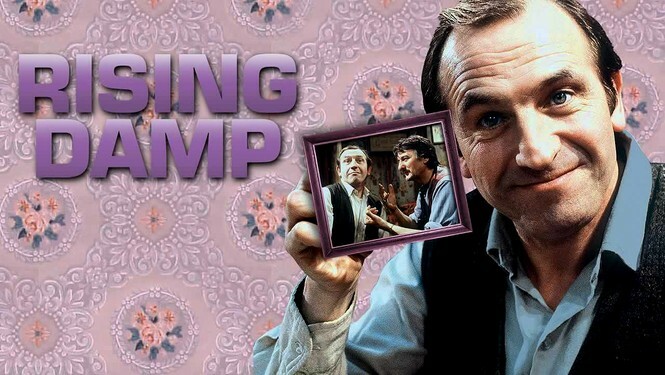 A 1980 movie version of Rising Damp won the Evening Standard British Film Awards for de la Tour, guest actor Denholm Elliott, and Best Comedy. During breaks in the filming of Rising Damp, Rossiter starred in the screamingly funny 21-episode/three season (1976-1979) sitcom The Fall and Rise of Reginald Perrin -- based on some dark, risqué, satiric novels by David Nobbs, who also scripted the series. In 2009-2010 it was remade in two seasons and 12 episodes as Reggie Perrin, starring the equally brilliant but much taller Martin Clunes. Both series are on Netflix, and the latter can also be streamed on Netflix Instant.